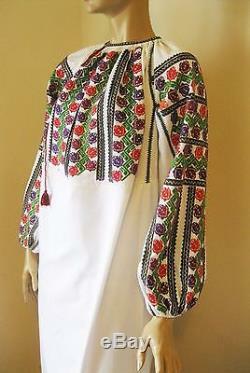 Is no more stylish to celebrate this summer than in a genuine Romanian peasant blouse! My blouses are top quality completely hand-sewn and hand embroidered on the finest gauze cotton with cotton and/or silk thread, they are pure art. 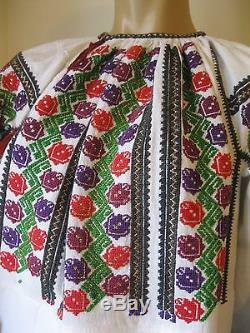 The blouses are decorated with rich traditional motives which can be traced hundreds of year back in history. Some of the motives have names like The Destiny Wheel, The Chamomile, The Comb , " The Stars " , " The Flowers in Lace " , " The Eagle " and it takes a embroiderer over one month of work to finish one garment, so intricate and fine is the pattern. There is no sewing machine involved, everything is hand done. The colors and intricacy of a genuine Romanian peasant blouse, the beauty and the perfection of the Romanian embroidery are all that can complete your charm and chic. THIS IS PEASANT ART DONE. 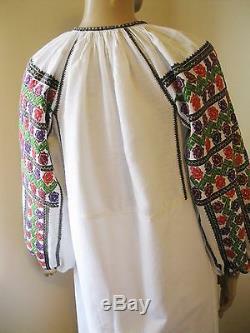 Hand Embroidered Romanian Peasant / Boho / Folk Blouse. 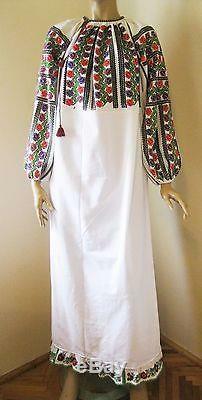 Splendid antique Romanian traditional blouse dress from Muscel area. 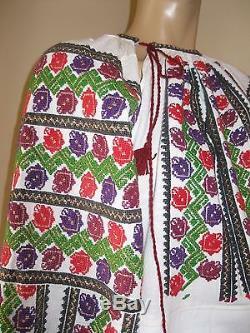 The dress is hand embroidered with multicolored cotton thread on white linen. It is also decorated with golden thread /tinsel. The dress is in very good condition with the regular traces of the wear for a blouse of this age. 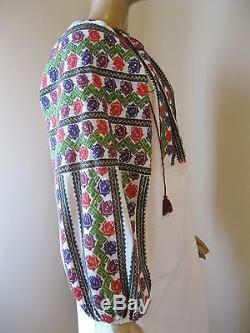 The black cotton embroidery is discolored due to the dress age. The tassel around neck is not the original one, we hand made it and the lower part of the dress was replaced because the older one was in very bad condition. Age of the costume: 50 - 60 years old. 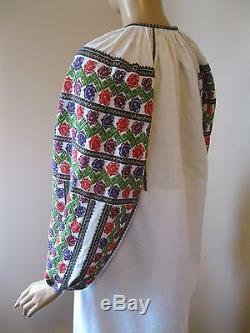 With a wrap skirt will form a complete costume from Oltenia. Measurements: dress length: 141 cm or 55. Around chest and waist: 118 cm or 46. Around neck it has 37 cm circumference (14, 56 inches). When you select a Romanian blouse , first measure your bust size (circumference around bust measured in cm or inches) then select a Romanian blouse which has 8 cm (3 inches) up to 15 -20 cm (6 -8 inches for a loose fit) more around the bust than your actual bust size. You can track the parcel on the web page of Romanian Post with electronic tracking after I will send you the number of the parcel. We offer for sale top-quality handmade products. We do not sell flawed blouses. Be a pleasure to reply to you as soon is possible. Thank you for shopping with us and be sure to add me to your favorites list. The item "Antique hand embroidered Romanian traditional blouse dress rose buds size S/M" is in sale since Thursday, October 22, 2015. 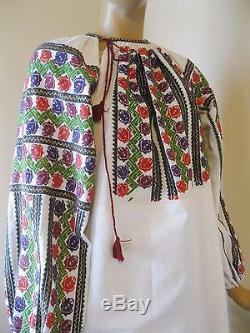 This item is in the category "Clothing, Shoes & Accessories\World & Traditional Clothing\Europe\Other European Clothing". 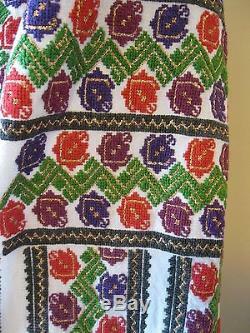 The seller is "romanianblouse2015" and is located in Baia Mare , Maramures .